You see white? Me too, and I’m bored. A new trend that’s begun to surface from glossy magazines into homes is colourful ceilings. This is such a great way to add a little drama to any room, and to show your neighbours who is the design guru on the block! Show’em what you’re made of! Ceilings, stairs and drawers! Oh my! Wallpaper is popping up in so many unique and quirky places! I personally am loving this trend! 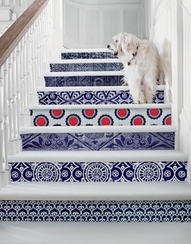 Adding a little pattern and colour in unexpected places gives any space a personality.